Easily palmable reel is as good as it gets for flipping and pitching. Dualthumb bars let you open and re-engage the spool clutch without touchingthe handle. Exclusive High Efficiency Gearing for raw, smooth power at alltimes. Super Stopper anti-reverse with Assist Stopper backup, aluminumframe with easy-access side-plate, and VBS centrifugal brake. 4+1 Bearings. "I teamed this reel up with a Shimano Crucial CRC76H....what a great flippin' and pitchin' rig. The dual thumb bar is the ticket!" 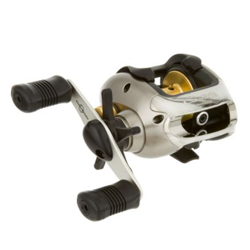 "I have used all brands of reels, shimano stands out. It took me a little while to get used to the new flipping trigger, from the older stile bar. Now I love it and I use this reel for buzz baits and frogs also for quicker activation of the reel." "This seems to be the best reel I have found to Flip jigs into heavy cover. I can make a long distance then let the bait free fall. Engaging the reel once you have a strike is made easy with the thumb bar." "This is a excellent reel. Although i think that the older ones with the full thumb bar are easier to use. It is much easier to engage the thumb bar on the older models."